This new book from Michael Spektor provides solutions for 96 linear differential equations of motion that describe common mechanical engineering problems in dynamics. These equations comprise all possible combinations of param­eters that can be included in the differential equations of motion describing actual engineering systems. A special Guiding Table directs readers to the section of the book with the solution corresponding to the real-life problems of their interest. It is vital reference for students and professionals who are solving problems in Engineering Dynamics. Includes the analysis of the structure of the differential equation of motion, as well as the analysis of the parameters that constitute this equation, presented in Chapter 1, enabling readers to understand the principles of composing the differential equation of motion for actual engineering systems. Presents a straightforward, universal methodology for solving linear differential equa­tions of motion based on the fundamentals of Laplace Transform. Provides Guiding Table 2.1, which uses the combination of resisting and active forces to guide readers to the section of the book that corresponds to the problems they want to solve. This table is also found on the inside front cover. Each section represents a standalone description of the solutions. There is no need to search through the book for additional information. Contains all required methodologies and supplemental information for solving the linear differential equations of motion. "Michael Spektor’s Applied Dynamics in Engineering addresses the issues..."
"...this is an excellent teaching or reference book for the student or professional engineer." Michael B. Spektor is the former Professor and Chair of the Department of Mechanical & Manufacturing Engineering Technology at Oregon Institute of Technology. He has an undergraduate degree in Mechanical Engineering from Kiev Polytechnic University and a Ph.D. in Mechanical Engineering from Kiev Construction University. He has worked in both industry and higher education in the United States, Israel, and the former Soviet Union. Specktor holds five U.S. Patents and two U.S.S.R Inventor's Certificates. Modern technology is rapidly changing, requiring the application of the most effective methods of improvement and development of engineering systems. These methods comprise the purposeful analytical investigations of mechanical and related systems in the area of applied dynamics. The main role of analytical investigations in the area of dynamics related to engineering systems consists of providing the possibility for purposeful control of the parameters of the systems in order to obtain the required performance of the system during the executing of the working process. Michael Spektor’s Applied Dynamics in Engineering addresses these issues. Way back in the final year of my doctoral studies, I was advised that I ought to have a graduate-level math course listed among my studies. I found a course that was scheduled to be taught the next semester entitled something like “Transform Calculus.” I had A grades in calculus, and I had been a “whiz kid” with the Fourier series, so I signed up for it. As you can imagine, there was a lot on my mind that semester. I found the course to be abstract and diverting. My disinterest was duly rewarded with a C grade—the only C that I had received since my freshman year. Since it was the only course that I took that term, I was surprised to receive a letter advising me that I was on academic probation and would have to take another graduate course the next semester and get an A grade to average out that C. I chose another highly technical course and got the A. Though professionally, I subsequently used other transform methods both analytical and experimental, the incident left me terrified of the Laplace Transform. My fear continued to stalk me, even though shortly afterward in my career I successfully held the title of “Structural Dynamics Engineer” with a Fortune 500 company. So I was again surprised when Dr. Michael Spektor, my long-time friend and colleague for 26 years, told me that over his 10 years of retirement, he had just completed the two above-cited books devoted to the use of Laplace Transforms in the solution of mechanical engineering and technology problems. I knew Michael to be a very accurate and successful professor and department head. And I was familiar with his research work on designing a vibration machine to penetrate soil. But Dr. Spektor’s new and independent scholarship on the use of the Laplace Transform is profound. He has searched the literature on transforms that would be specific to the study and practice of mechanical engineering only. And he reduces his findings to 96 transform pairs that meet the specific needs of mechanical engineers. This I learned from him as I now enter the final year before my own retirement from teaching. I expect that checking through some of his many transform pairs will be an early pleasure of my own retirement and my own overdue conquest of this, my personal Chimera. 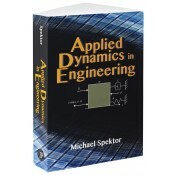 The book Applied Dynamics in Engineering by Michael Spektor, presents the solutions for engineering problems in a variety of applied topics. The range of material presented illustrates the in-depth background of the author. The focus of the book is the use of differential equations as a foundation for mathematical/engineering solutions. The author talks in the language of a teacher; his phrases are exact in nature and most pleasant to read. The use of Laplace Transformation is well illustrated, and the inclusion of a table for Laplace Transform Pairs is very useful. The solution for partial differential equations is well served by this text as well. In fact, the author’s use of this solution technique is most impressive. In summary, this is an excellent teaching or reference book for the student or professional engineer. In his two-book, combined presentation of dynamics, Applied Dynamics in Engineering (2016) and his earlier work Solving Engineering Problems in Dynamics(2014), Dr. Michael Spektor sets up, for anyone interested in the subject, a unique approach, facilitating an intuitive understanding of dynamics in application to design. Rather than a traditional vector approach to the topic, he presents a linear systems treatment. There are many advantages of this approach, especially as an introductory course in dynamic system analysis and design and particularly in an engineering technology curriculum where a student has only one semester’s exposure to the subject. Of advantage to students is how Spektor progresses from the most fundamental dynamic system configurations of inertial mass, spring compliance, and friction to those of wide application in machinery. With Spektor’s presentation of dynamical concepts, the design implications are always front and center. The student proceeds through fully documented and extraordinarily detailed examples of every applicable system. All mathematical detail is related to the Laplace Transform solution of linear differential equations, which has universal application in measurement, instrumentation, and electric circuitry. Unavoidable mathematical complexities also are covered in the shorter companion volume. For engineering technology students, this approach to learning dynamics directly builds on and parallels the formal mathematical training they are applying in other analytical subjects. I would have loved it if Applied Dynamics in Engineering had been available when I was first learning dynamics, and I look forward adopting it in an engineering technology curriculum.